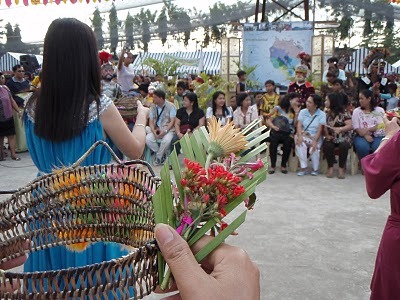 The tubong or putong, is a ceremony indigenous to the island of Marinduque, Philippines. 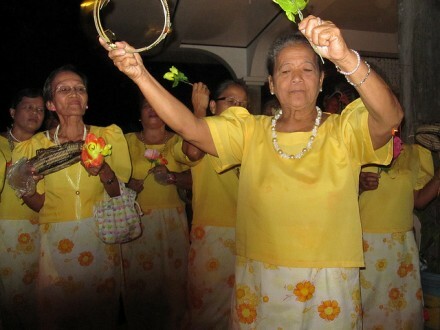 Literally, the word “putong” means to crown, is a song of thanksgiving, hope and prayer for a long, blessed life. According to beliefs, the patron saint rejoices at this kind of celebrations and intercedes for the honoree in his wish for long life, happiness and safety from accidents and bad luck. Commonly performed to welcome guests and to wish them good life, health and luck. It is also done during birthdays, anniversaries, graduations or any special events that a person is thankful of and praying for a blessed path in life. All around the island of Marinduque, the performance is relatively the same. The “mamumutong” (performers of tubong) wear costumes such as kimona and saya for ladies (like pictured below) and barong for men. They bring with them baskets of fresh flowers, palm leaves and coins. They will sing and dance accompanied by a guitarman. 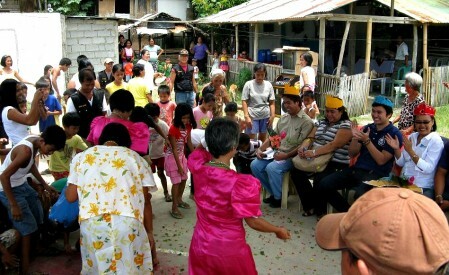 The ceremony begins as the “mamumutong” or the “manunubong,” gather around the host’s home. As they enter the house, they will explain their purpose and request for host’s hospitality. Narito po kami, Mahal na maybahay. Tinugtog na namin ang instrumentong taglay (We are here, dear host. We are already playing our instruments), goes the song. The first part is known as the “pananayawan.” The verses are sung slowly until everybody is in the receiving room. Next, the honoree is seated on a chair (supposedly the throne) at the center of the room or stage and with two family members beside the honoree, each holding a lighted candle. Pag-akyat namin sa mahal mong baitang, may dalawang anghel ang aming nadatnan. Tig-isang kandila ang kanilang tangan, sa tamang umaakyat ay tinatanglaw (As we enter your home, there are two angels waiting for us. They have candles to guide us). The song’s tempo picks up, as celebration reaches its climax when the crown is placed on the honoree’s head. Nang kami ay dumating sa loob ng Herusalem, ang palma ay sa kamay, korona’y sa ulo. Kahimanawari’y magkapantay ito, sambahi’t igalang nitong buong mundo (When we arrived at Jerusalem, palms in our hands, crowns on heads. Hoping that the world will praise and respect them). The performers shower the honoree with flowers and coins, symbolizing affection and wishes of good luck and prosperity. During this moment too, the host and other guests throw candies, coins and paper bills to the honoree, as children and adults alike rush in for the bounty. The room will be filled with laughter and scream of happy attendees. It is said that the crown and the coins must be kept for good luck. Kahimaniwari’y habaan ng buhay, sa mahal na santong aming pinutungan. Kahimanawari’y siya ay ilagay, mahabang panahong walang karamdaman. Ipag viva natin tuloy ipagdiwang ang mahal na santong pinutungan (We are hoping that the saint that we crowned will have a long life. We are hoping that he would be free from any ailments. Let us celebrate for the saint that we crowned). If you enjoyed the bits of information about the Marindque’s Putong, and wants to read more from The Mixed Culture, make sure to subscribe to my mailing list to read my latest blog straight from your inbox. Or, follow me on Facebook orInstagram for the latest scoop from me. Feel free to email me for any questions or comment below. Hello. Who took the photos? I’m doing visual research for an encyclopedia. You may email me at pinaykikaylife@gmail.com. Thanks.